Established for 50 years, Watford Workshop is a registered charity that provides Work Experience, Skills Training and Employment in a safe, inclusive and professional environment, for people of working age with physical, mental and sensory disabilities and/or learning difficulties, helping them to achieve greater independence, become more integrated into the community and where possible move them on to mainstream employment. It is the only project of its kind in Hertfordshire. More than 60 disabled and disadvantaged service users attend the Workshop over the period of a year under two schemes – Health & Community Services and Work Choice. 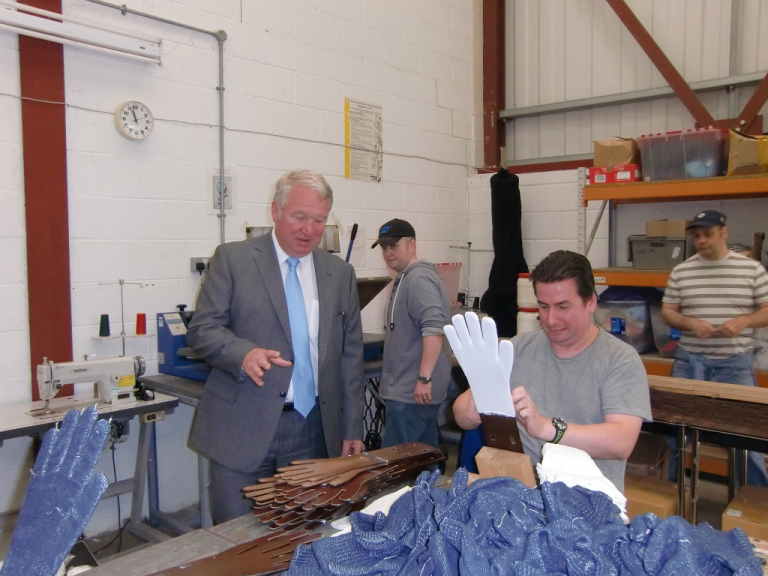 As a means to keeping disabled and disadvantaged people in employment and training, Watford Workshop delivers comprehensive, high quality and competitively priced services to their commercial customers. The Minister said that he was impressed by witnessing first-hand the full integration of people with varying levels of disabilities and learning difficulties, able-bodied workers and volunteers, operating together in a fully supportive and attentive environment. This provides ‘on the job’ work skills which take into consideration the personal needs and abilities of each service user (including learning how to work with others, production techniques, moving & handling, health & safety and fire safety). Life skills training in areas such as IT, literacy, numeracy, money management and food preparation are also key programmes delivered by the Workshop, contributing to help social interaction, work accountability, independence and above giving service users a sense of worth and self esteem that they are positively achieving in the workplace. He also commended the Workshop’s recent success in assisting two disabled people to obtain full time employment at Morrison’s recently opened Watford supermarket and emphasised that continued efforts must be a priority. He also noted that Watford Workshop’s support has enabled service users to move to independent living (8 people), support dependents (6 people) and to volunteer with other organisations (4 people) during 2013.